Eternal vigilance is the price of freedom. If you wish trouble free driving you must regularly check all components of your vehicle. If you wish that your vehicle performs in peak condition you ensure that suspension of your vehicle is in the right condition and shape. Our skilled mechanics are competent to repair suspension of all the latest products of both light and heavy commercial vehicles. We check your vehicle’s suspension system by using the latest tools and exactly fit our lowering settings to your vehicle. To reset and replace your vehicle’s springs, we replace shock absorbers, ball joints, idler arms and rubber bushes. As the steering system components are susceptible to wear out, we repair and service steering wheel, a steering shaft, column, a flexible coupler, universal joints,steering arms, and ball sockets. We make sure that the steering system remains at the proper angle and tyre-to-road contact. 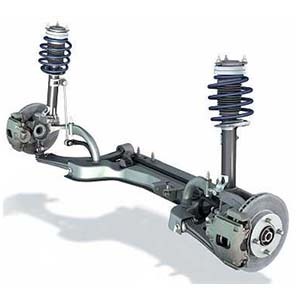 By providing following Steering & Suspensions, we enhance safety, performance and mileage of your vehicle.